Keeping houseplants of any kind is always in style, although at times, some are more in fashion than others. 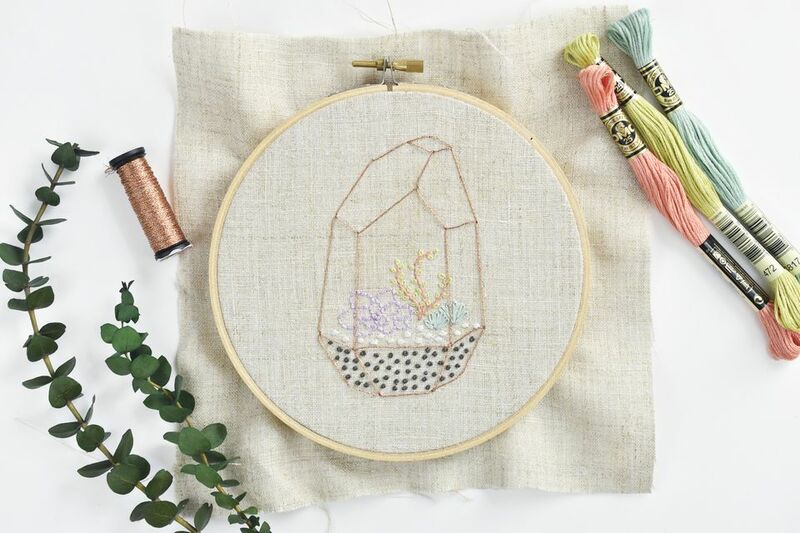 Just as growing succulents is popular, so is stitching them, and you can do that with this free modern terrarium pattern. To give these succulents a really modern feel, use pretty pastels for the plants. It's okay if the colors aren't straight out of nature! Stitch the terrarium frame with a metallic thread so it looks exactly like the beautiful designs you would want on your windowsill. The long frame stitches make this a delicate piece of stitching that can snag easily. So it's best to frame this and hang it on your wall. But if you want to add the design to some clothing or another item, we have tips on how to make that work too! Grab your embroidery supplies and get your green thumb ready for some stitching! The Modern Succulent Terrarium pattern is a downloadable JPG file that you can resize as you wish. You can use a basic image-editing software or the print menu output size for this. The sample embroidery is about 4 inches tall and fits nicely within a 6-inch hoop. Mark the pattern on your fabric using your favorite transfer method. Most methods will work for this, however, it's best to avoid the tracing paper method, as the tiny details in this would make it tricky. Place your fabric in a hoop and start stitching, following the color and stitch guide below. Start with the plants and soil, then finish with the terrarium frame. For a modern look, use these natural shades and pastel tints for your succulents and soil: DMC 352, 210, 3817, 472, 3866, and 844. If you'd prefer to make this a little more traditional, work with muted greens for the succulents. Hen and chicks, the plant on the left, is sometimes a dusty purple, so that's a good option too. Working with metallic threads is often tricky, but it's worth it for this pattern. Choose copper, gold, or silver. The sample uses Kreinik 021C. Work the entire design with three strands of standard embroidery floss. If you are using braided metallic floss for the frame, use fine #8 braids, which does not separate. Stitch the center of the hen and chicks succulent and the soil dots with french knots. Work the tiny stones with satin stitch. Use stem stitch for the stalk of the sedum or "jelly bean" succulent. Form the foliage of the sedum and Senecio plants with detached chain stitch. Work the outline of the "hen and chicks with back stitch. When you finish all of the plants, soil, and stones, add the terrarium frame with back stitch. If you are planning on displaying this on a wall or using your embroidery for something that won't get a lot of wear, use long stitches for the frame. Each line on the geometric shape should be a single stitch. However, if you want this embroidery to go on something that gets a lot of use, for example, a bag, work the terrarium outline with a standard-length back stitch. You may also want to switch out the long detached chain on the Senecio for back stitch.